There's no denying the gritty honesty of this film, at least with regard to Russell's character. There's a certain melancholy to a lot of country music that seemed to make Scott Cooper's Crazy Heart redolent with a kind of ragged sensibility that was perhaps best summed up by the title of its Academy Award winning song, "The Weary Kind". There's a different kind of sadness running rampant in Cooper's latest, the dour but often compelling Out of the Furnace, a film that in lesser hands might have been more of a straight ahead revenge thriller without much to recommend it other than a visceral killing or two. The revenge aspect of Out of the Furnace almost plays out as a tangent here, though, for there's a deeper tack that Cooper ends up exploiting, a penetrating examination of lives with no hope for a better future, but with an innate nobility nonetheless. That nobility is weathered, though, filled with the scuffs and scars of experiences that seem to echo some perverse mantra of "life isn't fair". While the film really concentrates on the travails of hardscrabble steel mill worker Russell Baze (Christian Bale), the film's dark, moody ambience is established from virtually the first moment with a modern day update of the iconic scene with Jimmy Cagney and Mae Clark in The Public Enemy, only in this instance we're dealing with a much more dangerously sociopathic criminal named Harlan (Woody Harrelson) , a character who isn't about to punish his nemeses with something as relatively harmless as a grapefruit. It's a startling opening scene, one which assaults the viewer with virtually as much force as Harlan assaults his perceived antagonists in the film, and it quickly creates a stifling mood of terror and impending doom. That mood was palpable enough to actually foster a lawsuit filed by a group of plaintiffs who share a surname with Harlan's character and who claim the film maliciously maligns not just their name but their ethnic heritage (the plaintiffs are part of a recently state recognized Native American tribe which has yet to receive Federal designation). Part of what makes Out of the Furnace such a depressing viewing experience is that Russell Baze (Christian Bale) is obviously a basically decent guy with his head screwed on straight, but he can't seem to get a break. As the post- credits film opens, he's at least happy in his home life with his girlfriend, Lena (Zoë Saldana), though his elderly father is at death's door, and his little brother Rodney (Casey Affleck) is suffering from PTSD after having returned from his latest of several deployments to Iraq, burying his psychological stress with an unhealthy gambling addiction. Russell questions Rodney as to where he's getting his cash, and Rodney kind of vaguely states that he's getting it from a local guy named John Petty (Willem Dafoe). What turns out to be the case is that Rodney has been appearing in staged fights for Petty, with Petty asking him to "take a fall" so that Petty can pay of his debts. That ultimately brings Rodney, Petty and even Russell into contact with Harlan, who is, in the words of Petty in the film, a member of a bunch of "inbred" mountain people (hence the aforementioned lawsuit). In the meantime, a frankly unnecessary trauma (considering the roiling emotional environment the film has already essayed) results in Russell being jailed, and during his confinement, his father passes away and Lena ends up marrying a local policeman (Forrest Whitaker). Rodney at least stays in touch with his brother, though it's obvious his mental state is deteriorating in a rather radical fashion. Despite its rather starry cast, Out of the Furnace failed to connect at the box office, despite debuting in a week when there weren't many other new big releases to contend with (meaning, ones that opened the same week this film did). It's really not hard to understand why. This is a fairly relentlessly dour and downtrodden feeling film, one that takes Russell through an almost Job-like series of trials and tribulations. Is there a silver lining in all the depression? With regard to the characters and the general plotline, surprisingly little. Several characters meet their (quite bloody) fates, but even Russell, who (and no great spoiler here) at least makes it through the film alive, is obviously one of the walking (spiritually as well as physically) wounded. The saving grace here is the honesty of the performances, though it must be added that several of these actors engage in what has become known as "mumblecore". Even Forest Whitaker spools out his lines in little one or two word increments at times, making this film feel even more interminable than its already pretty gritty environment does to begin with. Harrelson has rarely been better, though, and his Harlan is a truly frightening creation. There's also an absolutely palpable sense of place in this film, and as someone whose mother was born and raised on the outskirts of Pittsburgh and as someone who still has an untold amount of cousins in the surrounding Pennsylvania countryside, I can vouch for the fact that Cooper has brilliantly caught the ambience of the locale. The film's screenplay involves a few too many conveniences for its own good (including an improbably placed cell phone call that provides impetus for the final act), but its depiction of two troubled brothers finding their own way through the thicket is often quite riveting, if never uplifting. 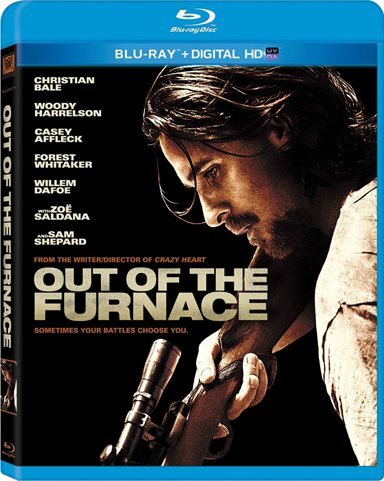 Out of the Furnace is presented on Blu-ray courtesy of 20th Century Fox Home Entertainment with an AVC encoded 1080p transfer in 2.40:1. As befits its sad and melancholic tale, this is a frequently very dark film, filled with looming shadows and an overall fairly oppressive ambience. Cooper and his cinematographer Masanobu Takayanagi do not artificially brighten any of these sequences, and so there is an intentional drabness and at times lack of depth running rampant through this film, especially in such notable scenes as when Russell and his buddy Dan find the backwoods house that Harlan lives in with his relatives. Even some exterior shots are gray, almost monochromatic, and filled with threatening clouds mixed with the effluent from the steel mills. Out of the Furnace's lossless DTS-HD Master Audio 5.1 has several things going for it, one of which is the very smart use of source cues (something Cooper talks about in one of the supplements on this Blu-ray). All of these utilize the surround channels very capably. The film also is quite nuanced in its ambient environmental effects, nicely detailing things like crickets chirping (the first thing you hear in the film, which is soon belied by the industrial setting). Dialogue is very cleanly presented, and the fight scenes offer some excellent immersion with some literally bone crunching foley effects. Inspiration features the principal stars discussing films that influenced them. Scott Cooper the film's director and co-writer. Crafting the Fight Scenes looks at the way these sequences were choreographed and shot. The Music of Out of the Furnace has Scott Cooper talking about how we writes with music playing, and how Pearl Jam's "Release" kind of provided the key to the film. There's no denying the gritty honesty of this film, at least with regard to Russell's character, but so much horrible stuff happens to the poor guy that you almost feel like he's wandered in from a bus and truck version of The Book of Job. While Harrelson's Harlan is a truly unforgettable character, he's so hyperbolic that he almost seems ported in from some ultra-dramatic entity featuring a version of Snidely Whiplash, albeit a backwoods iteration. The screenplay gets a lot of the dialogue just right, and the feel of the blue collar working class folks is also laudable, but this is one big downer from start to finish. The technical aspects of the disc are first rate, and for those who like the cast, Out of the Furnace comes Recommended. Download Out of the Furnace from the iTunes Store in Digial HD. For more information about Out of the Furnace visit the FlickDirect Movie Database.